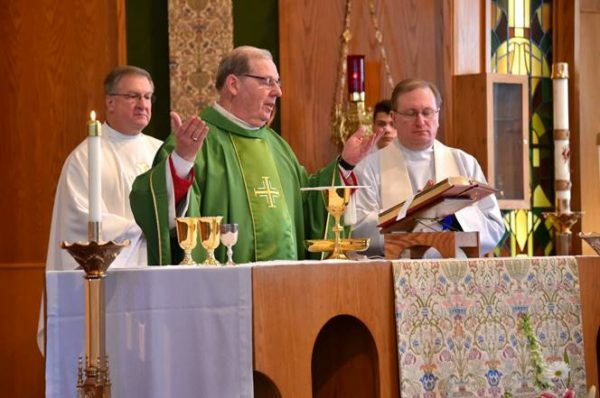 AUGUSTA—Bishop Robert P. Deeley commemorated World Marriage Day on Sunday, Feb. 10, by celebrating Mass at St. Augustine Church, during which he offered a blessing for married couples. “Look with favor on these husbands and wives whom you have united in marriage. As they ask for your help and the protection of St. Joseph and the Blessed Virgin Mary, bless their love and commitment,” the bishop prayed. Commemorated annually across the United States, as well as in some countries around the world, World Marriage Day is a celebration of Christian marriage which honors husbands and wives as the foundation of the family. Bishop Deeley said that while the word vocation may bring to mind the priesthood and religious life, it’s important to remember that marriage, too, is truly a vocation. “Just as priesthood and religious life have a purpose and a mission in the Church so, too, does matrimony. Pope Francis reminds us in the apostolic exhortation, ‘The Joy of Love’, which we have been reflecting on for the last 18 months, that Jesus’ purpose and mission for marriage and family life ‘is to bear witness to the love of God and to live the life of communion,’” the bishop said. Couples from the Augusta area who gathered for the Mass said they embrace that mission, emphasizing the importance of keeping God at the center of their marriages. “It’s a very special vocation. It takes a lot of work, a lot of compromising, and just keeping God in everything that we do,” said Linda Turgeon, who has been married to her husband, Andy, for 46 years. “That was important to us right from the start – to be able to, after we got married, find a place where we could be part of a bigger community of close family and friends, being able to reach out to people that we hadn’t even met yet to make a difference together,” said Frank Cuff, Elizabeth’s husband. “Our marriage wouldn’t be complete without God. God brought us together, and we truly feel that through the sacrament, we get to thank God for the gift of each other,” said Amanda Harvey Turcotte, who has been married to her husband, Joe, for three years. During his homily, Bishop Deeley stressed the importance of worship and prayer and allowing Jesus into our lives, saying when we bring him our fears, brokenness and sin, we are strengthened by his forgiveness and his love, allowing us to then forgive and love each other. The bishop also urged the couples to live their marriages with joy, calling it the antidote to the negative attitude toward marriage often seen in our culture today. “Show it for the beautiful thing it is in living out your marriage, loving each other, willing the good of the other, together,” he said. The World Marriage Day Mass marked the end of diocese’s 18-month celebration of “The Joy of the Family,” which, as the bishop noted, reflected upon Pope Francis’ apostolic exhortation, Amoris Laetitia (The Joy of the Love). The celebration included monthly prayers, reflections, Scripture passages and suggested actions, intended to strengthen families and emphasize their importance in God’s plan. World Marriage Day, which got its start in Baton Rouge, La., has been celebrated since 1981. The theme each year is the same: “Love one another,” something the bishop said is more than merely a feeling. During the Mass at St. Augustine Church, prayers were offered for all married couples, that their vocation of unity, love and fidelity may reflect the essence of Christ’s sacrificial commitment to his bride, the Church, and for all those who suffer from troubled of broken marriages, that they may come to know healing and trust through God’s mercy. The Mass, which was concelebrated by the Rev. John Skehan, pastor of St. Michael Parish, which includes St. Augustine Church, was followed by a reception in the church hall.